There are some unusual, high-paying jobs out there – and caddying can be one of them. If you are an avid viewer of golf on tv or have a passing interest in the game – you may be surprised at what some of the professional caddies can make. In 2013, Tiger Woods won The Players Championship – considered by many to be the 5th “major”. The Players has one of the highest purses in the game – at $9,500,000, with $1,710,000 going to the champion. Not bad for 4 days of work! 2 How do you become a professional caddy? When college was out for the summer, I had the opportunity to caddy for a professional golfer. The city I lived in was host to an LPGA (Ladies Professional Golfers Association) event, so I put my name into the hat for some of the lady professionals who may need a caddy for the week (a few didn’t have steady caddies and others were letting theirs go). I happened to get lucky and scored a very talented professional for the week. Most tournaments on the LPGA Tour are 3-days with a cut after the second round. This was no exception. We had two days of practice rounds – including a Pro-Am (where the pros are paired with amateur golfers – most of whom are from the companies who’ve sponsored the event) and then we were underway. While my pro made the cut – she ended up finishing toward the back of the pack. I believe I made $500 for the week (not bad for a college kid) and got a great education about the professional game and caddying. Now, back to Tiger’s caddy, LaCava. Based on his season earnings of $8.5 million, LaCava netted at least $1,000,000 on the year (not including taxes). How do you become a professional caddy? The life of a caddy is not as glamourous as it may seem. If he/she has close family – he will spend many weeks away from them, on the road traveling, and in hotels. They’ll also spend countless hours on the practice range with their player and walking/carrying heavy equipment around. 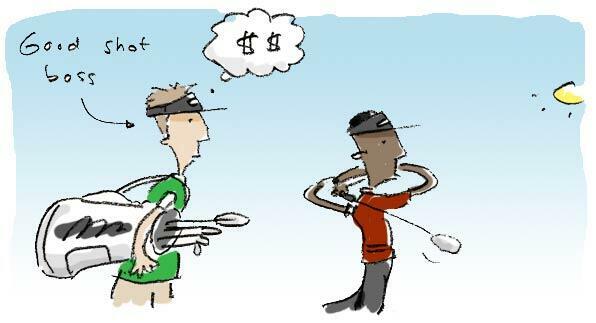 Still, if you love the game of golf, it can be a fun way to make a living. There aren’t many jobs out there and you can’t just go and fill out an application to be considered. According to the Professional Tour Caddies of America (which helps to promote the profession on the major professional tours), it’s best to make contacts on the “mini” Tours (Symetra Tour – also known as the Futures Tour – for the ladies; and the Web.com Tour – for the men). These lower-tiered Tours is where many bright, young hopefuls start out. Crab-fisherman – You’ve probably seen the show, Deadliest Catch which depicts the real-life jobs of fisherman on the Bering Sea. While it is a high-risk profession and the pay is unstable, its conceivable you can make $50,000 in a short period. Roughneck – Another “tough” job – you could also take home around $50k for a job on an oil drilling rig. Hey, you may even land a part in the next reality tv show. Crime Scene Cleaner – While I wouldn’t wish this job on the worst of enemies, it probably falls in line with someone who has an interest in being a funeral director. White House Calligrapher – Yes, the White House has a calligrapher. Well, actually two of them. The top writer (artist) makes $90k. Dog Walker – According to the Business Pundit, some dog walkers make as much as $50 an hour in bigger cities. Not bad for a few hours of work. Know of any other, unique, higher-paying professions out there? Could My Job Be Done By a Robot? Fun post, Aaron. My only caddying experience was at a club pro competition. On one of the first holes, the pro I caddied for hit his drive into the woods. After finding his ball, he quickly pulled a club. I asked what the game plan was. He said, “game plan”? It was a very long afternoon. On the other hand, a good friend got a full ride to college via a scholarship from the Evans Scholars Foundation, which is for young caddies from families who otherwise may not be able to afford college. I think it’s not so much about the caddy job itself as it is about the people you meet caddying. One of my friends from my university days found a really good job because he was caddying for his now-boss. I thought they just paid them an agreed upon amount of money. I assumed the amount of money was high but not based on a percentage of the golfers winnings. Why didn’t I take up golf as a child??? The last time I caddied my entire earnings were a turkey sandwich after the first nine. It was worth it though, as it was a fun day on the course. Hoping the guy will make it big-time and keep me when he gets his tour card. Awesome post. I will link this post to my page that talks about roughneck jobs. I get tons of viewers who are looking for jobs like these. Wow that’s pretty awesome that he makes so much! @Michelle – yeah, pretty unreal. Of course, he is the exception, but a lot of ’em can do pretty well.